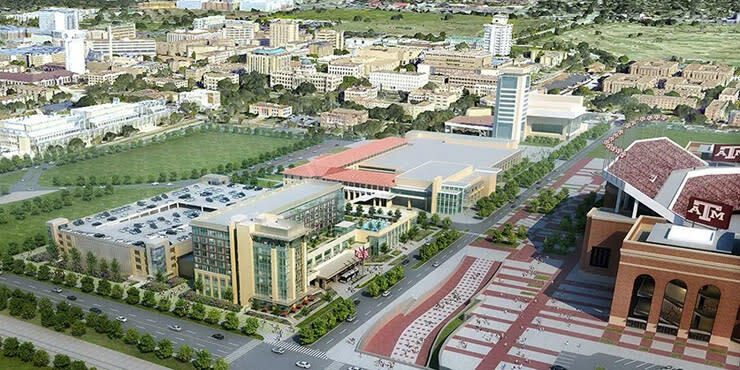 Expected to open in September 2018, the new Texas A&M Hotel and Conference Center is located across the street from (and overlooks) one of the most iconic stadiums in college football—which also moonlights as a world-class meeting facility—Kyle Field. At eight stories tall with over 35,000 sq. ft. of meeting space, this new development will create a unique meetings package for planners that includes an excellent hotel location, entertainment and easy accessibility to Texas A&M’s state-of-the-art facilities. The conference space includes an 8,300-sq. ft. ballroom, which can comfortably accommodate 650 guests. The hotel, which has 250 guest rooms, provides luxury amenities along with a pool, full-service restaurant, sports bar, gym, business center and more. Next door, Kyle Field includes a variety of unique facilities and over 115,000 combined square feet of meeting space. It is one of Bryan College Station’s venues eligible for the Preferred Access Agreement as well. Group spaces at Kyle Field include: the Founders Club, a three-story, 8,000-sq. foot space with views of the Hall of Champions; the Legacy Club, which includes an 11,250-sq. ft. lounge; the Presidential Lounge, which features 3,000 sq. ft. of space and north end views of Kyle Field, and more. Want to learn a little more about this exciting meeting package or get more information on the new development of the Texas A&M Conference Center? Reach out!